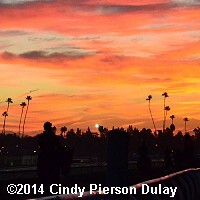 Thursday morning at Santa Anita Park was a bit cloudy which made for a gloriously colorful sunrise. More Breeders' Cup contenders took to the turf, including several that galloped down the hill and across the main track. With Day 1 of the Championships tomorrow, horses should have completed training for their big races by now, with some Saturday starters possibly galloping during a shortened session Friday morning. Aktabantay was scratched from the Juvenile Turf today due to a sore foot, allowing Faithful Creek to draw in. Here are photos for 22 of the horses on the track this morning. Click the small picture to see a larger version. We arrived in the pre-dawn darkness, so some of the photos taken before sunrise are a bit dark, but that is beyond my control. Shared Belief galloped 1 1/2 miles before sunrise under exercise rider Sal Martinez in preparation for the Classic. 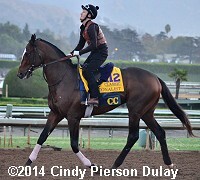 Trainer Jerry Hollendorfer said, "He had a nice gallop and stood in the gate. He will go to the paddock this afternoon and he will stand in the gate again tomorrow. The gate is something that I do with all of my horses." Tonalist galloped 1 1/2 miles on Thursday morning and then visited the paddock. Christophe Lorieul, assistant to Christophe Clement said, "He�s still learning. I would say there is much more to come. He�s still a big baby. I just hope he never realizes how big he is. He�s right above 17 hands so he�s a big horse. He�s got a real personality and is really a lot of fun to be around. He was a little fresh in the paddock today, but then he settled down and behaved perfectly. It was nothing of any great excitement. Everything is good and we are very happy with him." Ria Antonia galloped 1 1/2 mile under Corey Black and visited the starting gate Thursday morning im preparation for the Distaff. Trainer Tom Amoss said, "I like it that we are toward the outside. It gives you a chance to ride the race as it unfolds and that is something you may not be able to do from the inside. I was very pleased with her race in the Spinster. She took the heat of the pace and was still there at the end. She just got beat that day by a better horse (Don�t Tell Sophia)." The Great War cantered on the main track. He will race on dirt for the first time in the Juvenile. Trainer Aidan O'Brien said, "Saturday�s race will be his first run on the dirt and we will just have to see how he handles it." By The Moon visited the starting gate, galloped 1 1/2 miles and walked through the paddock Thursday morning under exercise rider Tom Singh. Trainer Michelle Nevin said of her Juvenile Fillies entrant, "When she first came into the barn, I thought she was a little on the small side. When she got into her training, she pushed along and I just followed her lead." Qualify trotted 1/2 mile and cantered 1/2 mile in preparation for the Juvenile Fillies Turf. Trainer Aidan O'Brien reported that he was happy with the condition of his filly. War Alert is the second also-eligible for the Juvenile Fillies Turf and likely will not draw in. International Star galloped on the main track in preparation for the Juvenile Turf. Grand Arch went out on the main track on Thursday morning. He goes next in the Mile on Saturday. Summer Front galloped 1 mile in preparation for the Mile. Assistant trainer Christophe Lorieul said, "He�s a very cool horse to be around. He extremely well. He just goes out there and does his job and comes back. He travels very well and and doesn�t mind anything at all. He�s very straight forward." 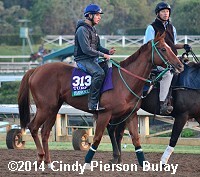 Bakken was sent out for a maintenance gallop over the Santa Anita main track. He goes next in the Sprint on Saturday. Bourbon Courage jogged on the main track Thursday morning in preparation for the Sprint. Fast Anna went out for a gallop Thursday in preparation for the Sprint. 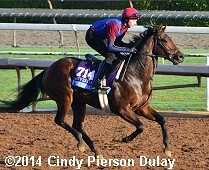 Trainer Kathy Ritvo said, "He�s still learning. He has so much talent, we decided to go in this direction," Ritvo said. "He�s gotten more relaxed in the paddock, more relaxed in his training. When we bring him behind the gate to school him now, he practically runs in. He wants to do everything right." Chicquita jogged and cantered on the main track in preparation for the Turf. Trainer Aidan O'Brien said, "She�s a lovely filly and I wouldn�t be worried that she got a little warm this morning � that�s just her. What happened to Magician was unfortunate, but with the fast ground here running him was not a chance we could take." 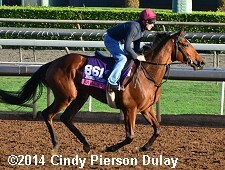 Finnegans Wake galloped 1 1/2 miles with exercise rider Stephanie Korger Thursday in preparation for the Turf. Trainer Peter Miller said, "That�s the $20,000 question," if the horse is improved enough to challene the best in the world. Hardest Core galloped 1 mile on turf under exercise rider Jody Petty, going down the hill and across the main track in preparation for the same journey in the Turf. "He looked just as good -�if not better -�than he did (before the Arlington Million)," trainer Eddie Graham said afterward.� "I�m just hoping he�s in the same kind of form as last time.� He looks great and the trip didn�t bother him at all - he's happy.� He shipped perfectly." 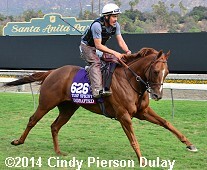 Starspangled Heat galloped on the main track in preparation for the Turf. Twilight Eclipse galloped on the main track. 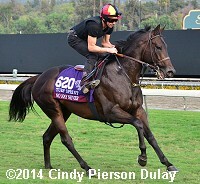 Trainer Tom Albertrani said of his Turf hope, "He�s in fantastic condition right now. I am really excited about the way he�s been training up to this race. He�s just been a little bit unlucky getting beat less than a length in those last three starts. He just needs a little more racing luck, but he certainly looks the part going in to the race." 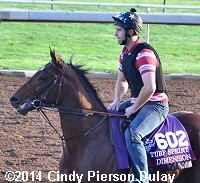 Dimension cantered on the main track the wrong way in preparation for the Turf Sprint. 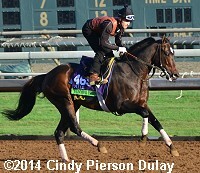 No Nay Never galloped down the hillside course in preparation for the Turf Sprint over the same trip. He slightly hopped when crossing onto the main track. Trainer Wesley Ward said, "I think he�s going to break super sharp this time and the pace will be his. I think the downhill might actually help him.� When he makes that right turn, they make a tiny uphill run and that should relax him as he heads back down the hill.� I think everything will be fine." Undrafted jogged up the hill and galloped down, testing the dirt crossover he will encounter in the Turf Sprint. Trainer Wesley Ward said, " If they do go too fast up front, I think the race will fall into Undrafted�s hands � so I feel good about my chances with both horses."